Continuity mistake: When Mac is locked out of the complex by the rest of the team, who think he may be a 'Thing', Childs uses an axe to try and chop open one of the doors, leaving a HUGE hole in the middle of it. Later Childs returns to that same door and the hole is significantly smaller and at a completely different location on the door. Continuity mistake: When the crew is outside and they're going to lock Blair in the tool shed, you can see someone nailing wood across the window on the front of the shed. The pieces of wood are horizontal. In the next shot (inside the shed), if you look at the window in the background, the strips of wood are vertical. When Mac goes back outside, the wood is horizontal again. 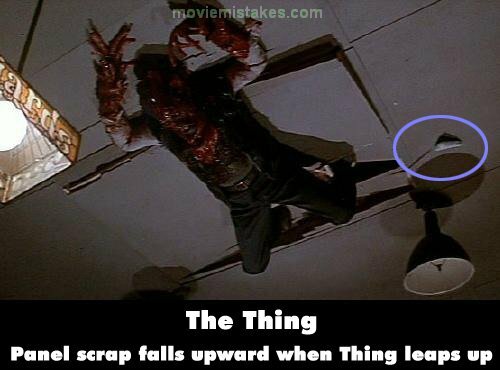 Visible crew/equipment: At the end of the film, where MacReady is about to fight 'the thing' you can see the shadow of a guy holding a boom mic, on the ground just behind him. Factual error: In the kennel scene, MacReady fires at least 7 shots from a pump shotgun. That particular shotgun can only hold 5. Plot hole: As the gun-toting Norseman approaches the buildings, Garry smashes the single-pane window with his handgun. It is inconceivable that the glazing in a structure near the South Pole would be single-pane glass, that could be broken so easily. Continuity mistake: When they are all outside and MacReady has separated the three most likely suspects and orders that they be tied down and tested, he comments at that time that they are to be hit by a storm in six hours. Cut to the scene where Mac is dictating into his recorder and he comments that the storm has been hitting them hard for 48 hours. However it is the same night and at best, maybe only an hour has passed. Revealing mistake: When MacReady burns the one "Thing" with the split head, in one shot it walks by MacReady in the foreground, and you can tell in that shot that it is just a still dummy burning, as it isn't moving at all. It just sort of floats past with its arms at its sides, while in the previous and next shots it is wildly moving around, arms flailing. Continuity mistake: When the Doc and Kurt Russel enter the burnt Norweigan building the door closes itself behind the Doc. It closes and opens several times over the course of the scene. Continuity mistake: When the three men are shown finding the UFO from the front, their hoods are down. In the next scene, from behind, their hoods are over their heads. The TV edit of the film differs widely from the theatrical release - lots of footage was purposely edited out, such as when the dead Norwegian on the table blinks, and there is also a narration. 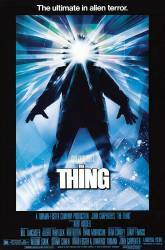 Director John Carpenter has publicly stated that he finds the TV edit embarrassing and a disgrace to his movie.